BACKGROUND OF THE PLUCKING ! ganization 'Beauty Without Cruelty Charity' documented this live-plucking on video. The video depicts horrified geese, held by their backs and wings while all their feathers are torn from their bodies. Some have their legs tied to their backs in order to keep them from moving. The tortured goose struggles and tries to escape till the point of exhaustion, muscular damage and broken bones. The pluckers' payment depends on the rate of the plucking, according to how many geese they've plucked. The fast pace is another cause of severe damage and horrible pain for the birds. Every feather torn can cause bleeding and wounds. The trauma from the plucking is still apparent days afterwards: after the first spasms of pain, the bird seems paralyzed and barely moves. Plucking live birds is such a cruel method, that even some countries which haven't forbidden the force-feeding of geese, have forbidden the live-plucking of birds.Geese raised for down do not have a painless life. 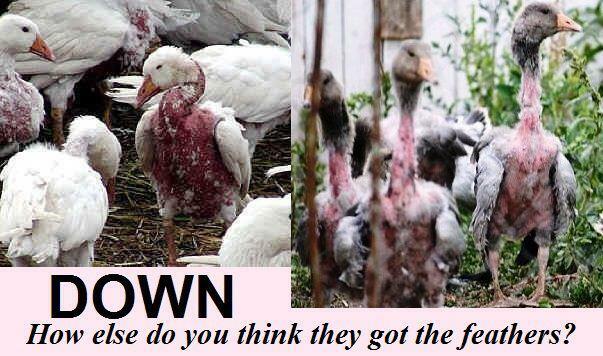 They are raised for down are live-plucked numerous times in their life. Some places that practice this will pluck the geese the first time when they are ten weeks old and then every six weeks thereafter, sometimes up they are four years old ! !This procedure is extremely painful for the animal. Birds, including ducks and geese, do have pain receptors in their skin from which the feathers are plucked. Studies indicate that the heart rate and behaviors of the animals clearly indicate that having their feathers plucked most likely causes both pain and distress. Imagine having all the hair on your head plucked out, one by one. Only imagine your follicles are really thick so that it's more difficult to pull them out. Now imagine having this done every couple months for four years.It's not like these animals are raised for food and the feathers are the end by product. There are actual farms which do nothing but raise geese solely to pluck their feather to sell to manufactures that produce down jackets, pillows, or comforters. Factories packed with geese and ducks supply the feathers in your household down comforter, but those birds may have had their feathers pulled out by the bunch while they squawk in terror. In Hungary, for example, feather rippers are often paid by volume, so they pull feathers out of the birds as quickly as possible, tying the birds’ legs over their backs during this process. Many are unaware of this cruelty, and the down market remains in high international demand. However, there are synthetic alternatives to down that prove equal in effect and often cause less allergies. There is a European Convention for the Protection of Animals Kept for Farming Purposes which recommends the plucking of feathers and down from live birds be prohibited -so why does it continue...? Tony Zadel - Facebook Link. Original post. ►►PLEASE WATCH An undercover investigation by Sweden's TV4, for a current affairs program called "Cold Facts," found another method being used: plucking the geese while alive. Investigative reporter Per Hermanrud said on some farms, workers "pluck the bird repeatedly about 4 times. "The reason, he says? Profit !! Down jackets, comforters, and pillows mean one thing for geese—the agony of having their feathers pulled out by the fistful.